Dish Network Claims Hulu Will Destroy The TV Industry. So What? Batten down the hatches, netizens! At a streaming media conference yesterday, Dish Network Vice-President of Online Content Development and Strategy, Bruce Eisen, said that sites like Hulu, which allow Internet users to watch certain television programming (and sometimes for free), may well destroy the television industry as we know it. That’s a bad thing if you’re Dish Network, but what if you’re the average person? My guess is that the average person really doesn’t give a toss about how the television business works, so long as he or she gets to see Glee or Dancing With The Stars (or pick-your-favorite-show). Dish Network’s concerns really don’t coincide with the concerns of the American family. 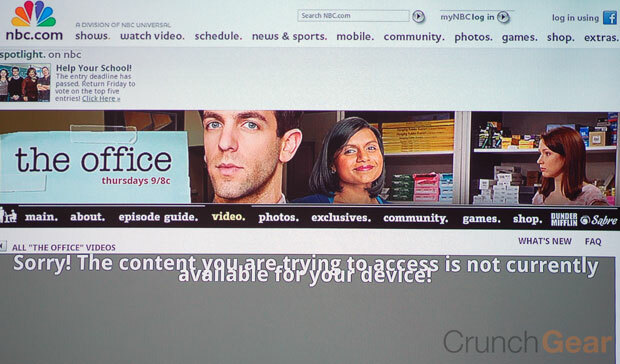 Eisen suggested that certain television episodes should only be made available to TV Everywhere devices, and then only a certain percentage of those episodes would be made available—30 days after their initial viewing. Didn’t DVR last night’s episode of House? No problem! You merely have to wait a full month to see it on Approved Streaming Site! Wasn’t the point of online streaming to “head off at the pass” people who’d illegally download programming? If someone downloads a 720p rip of Modern Family, that’s zero revenue for the relevant parties, namely the network, the production studio, and the television provider. But, if you were to offer this program online, you could at least ensure you’d earn advertising revenue. Or, failing that, you could charge a nominal fee. A sort of, if people like this show so much, surely they’d pay $10 per month to keep it on the air, or online? And if they’re not willing to pay, forget ’em. These shows do, in fact, cost money to produce. Money has to come from somewhere, right? But as Matt and I were just discussing, the fear that people will disown their traditional television consumption methods is probably a little bit overstated. Google TV, the One Product that’s supposed to revolutionize the way we watch TV, namely thanks to search, is very much still in beta. And you may be willing to put up with lack of polish if you’re a techie, but if you’re just a family-man who wants to come home from work and relax for an hour before going to bed? The last thing you want to be doing is fiddling with some newfangled device that really isn’t any more convenient than hitting the On button on your cable company’s remote control. You know, just like this! And let’s not forget that more than one-third of Americans still don’t subscribe to broadband. What happens to ISPs when every single one of their customers is streaming video 24/7? That’s an awful lot of bandwidth, so much so that they may have to charge you for it. All of a sudden, your scheme of “getting one over” on the cable companies doesn’t quite work out. You either pay Comcast the $100 per month to watch television the “regular” way, or pay more for Internet access in order to keep streaming away. Never mind that HBO, the premium cable channel, just reported that it has seen zero evidence of so-called cord cutting. Back to Dish Network’s concern, that Hulu et al. will destroy the television industry. Well, the television industry holds all the cards here. If it’s deathly afraid of streaming sites it can simply stop supplying content to them, or be far more selective with who (or what) gets to tap into that content. It can decide not to cooperate with the likes of Google TV, leaving Google (and its partners, like Logitech and Sony) to do what, exactly? And unlike the music industry, which was partially the victim of its own format (that is, music files are small enough to be traded pretty much at-will), streaming video eats up a lot of bandwidth, and you can be sure ISPs aren’t going to be happy watching you stream gigabytes of data every day when you’re paying the same amount for your Internet connection as the grandparents next door who only check out photos of their grandchildren on Facebook once a week. The television industry has a number of choices to make in the coming years, but it’s probably not going to coming crashing down tonight at midnight. If anything, the television industry would be better served worrying about the quality of its programming, of which it has total control over, and not freaking out over how people may or may not consume said programming many years hence.